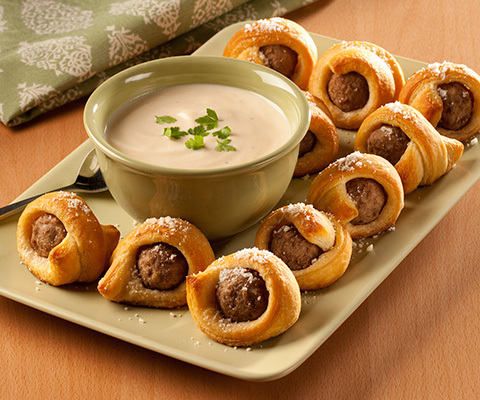 These tasty bite-size appetizers are perfect for your next gathering of friends or family. Thaw meatballs according to package instructions. Preheat oven 375°F. Unroll each dough onto flat surface, separating each crescent roll into 8 pieces. Cut each piece in half to form 32 narrow triangles. Place a meatball onto each triangle and roll up. Bake for 12 to 15 minutes, or as instructed on the package instructions for the dough. Remove from oven and sprinkle with cheese while still warm. Serve with warmed Pasta Sauce for dipping sauce. If desired, substitute Classico Four Cheese Alfredo Pasta Sauce with Classico Creamy Alfredo Pasta Sauce.